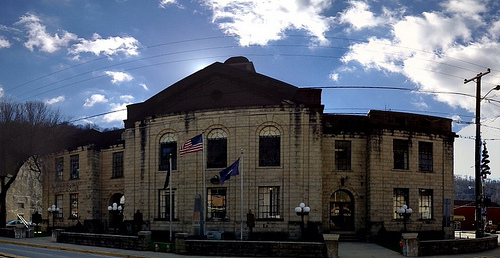 Martin County Courthouse - Inez, Ky. Without a doubt, Kentuckians are proud of our freedoms, our nation, and our flag. But I was immediately struck by a different form of patriotism when I entered Martin County: I was immediately taken by the number of Confederate flags flying on and in front of Martin County homes. To many, the Confederate flag is nothing more than a racist symbol of hatred. For others, however, it is a cultural and historic reference to ancestors who fought and lost their right to independence. While I am sure there are some Martin countians who wave the Confederate banner for the former reason, I am confident that the vast majority do so for the latter. The people of Martin County I know and those I encountered while in Inez were and are all warm-hearted and willing to extend a friendly greeting to a non-native. This, however, is truer throughout Appalachia and rural Kentucky than it is in any urban setting. And some high-profile visitors received in Inez have given her residents opportunity to exercise this hospitality. 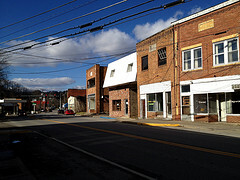 At roughly 35%, Martin County has among the nation's highest poverty rates, though it is fifth among Kentucky counties. Martin County and its seat, Inez, became the face of poverty in 1964 when President Lyndon Johnson and his wife visited. In fact, it was on the front porch of of Tommy Fletcher's shack that President Johnson declared "war on poverty." A coal boom in the 1970s brought jobs and a degree of prosperity to the region, but many of those jobs have been lost and coal seams exhausted. Presidential candidate John McCain returned in 2008 to Inez, which he described as one of America's "forgotten places." As part of his 2008 presidential campaign, John Edwards also visited Martin County to highlight his perspective on "two Americas." I did not stop along the rural highways of Martin to stop and photograph the scenery. I wish that I had. Even with the negative environmental impacts caused by surface mining and mountaintop removal, reclamation efforts and untouched land leave behind spectacular vistas and images of quintessential Kentucky. It is no wonder then that until 1874, Inez was called Eden. Or that two of Martin County's other hamlets are named Lovely and Beauty. I would love to return to Martin County. There is great history in the small communities of Warfield and Beauty. The questions though are how? and why? The road to Inez is certainly one that is, excepting the regular supply of coal trucks, less traveled. To arrive in Inez or in Martin County, one must make it their destination. I plan to do so again.